UPDATE: Zingarella's has now closed its doors. Review for historical purposes. For great pastries, try the amazing Cocoa Patisserie instead. To be honest I have eaten trays of Zingarella's pastries over the years as they feature quite heavily at functions within the Italian community here but have previously never made it down to the cake mother ship in the soon to be spruced up Brighton Marina. The interior is very simple and very Italian, with marble cafe tables and a lovely long display of colourful pastries. There is loads of outside seating which I would guess gets all used up on long summer days. Really popular and not hard to see why, Zingarella's create a bevvy of traditional Italian pastries, pretty little mignons and large cakes to order. If you don't have a sweet tooth, you can order toasted paninis, salads and the like. They have an ice cream counter for passers by or ice cream sundae treats to eat in. I see they have delved deeply into the 80s and now offer home made sorbets put back into the fruit - remember those? Sadly, I only saw these on my way out but vow to return for one whilst wearing something neon. This time I had a modest selection of the mini pastries and a very good coffee. 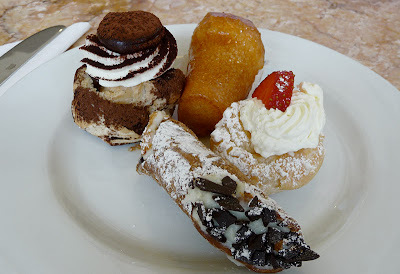 The cannoli are worth the trip on themselves but I also had a rum baba and a chocolate and a strawberry cream filled choux pastry. Actually, these tasted better than any I have sampled at the functions as they were really fresh. I would have liked more rum in the baba (as always, because I'm a lush) but the crisp shell of the cannoli and the soft cream were great. I do prefer them with the more traditional sweet ricotta and edge dipped in pistachios but I'm being picky! I spied large versions of the cannoli which I'd say were definitely worth a punt. There is a knack to eating them without covering yourself in cream and powder but if you train really, really hard and eat them frequently you'll get as good as I am.